RogueMage and Yukl-for all their help and patience. XP32-for excellent work on the Maximum Skeleton. Neovalen-for excellent work on Dual Sheath Redux. DarkAngel13-for support and great work on Faster Stand Up. Ebrithil Umaroth for making the NMM installer. This adds new optional animations and refines vanilla animations for players who appreciate the overall feel of the vanilla style. Check the file page for available modules and optional files. (Left video) New and adjusted animations in V2.0. (Right video) Just a sample of what I'm currently working on (May 1st). (Left video) Here is another one of my crappy rendered videos. I use HiAlgoBoost because my computer is an abacus. If it is unbearable, skip to 0:57 for a clearer picture and animation showcase. (Right video) Here is a showcase of some animations coming in V2.0. 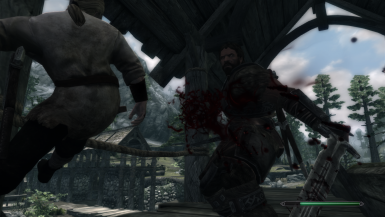 To install: First, backup your Skyrim/data/actors/character/animations folder just in case you do not like these animations (particularly if you're installing manually). Then, use Nexus Mod Manager to install, or copy the meshes folder into the Skyrim/data folder and overwrite when prompted. To uninstall, remove the .hkx files from the meshes/actors/character/animations folder. Use the zip file you downloaded as a guideline. 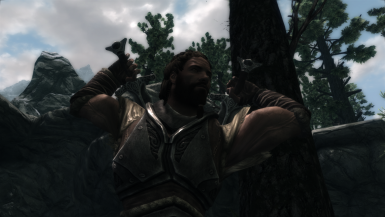 My weapon sheaths are not in the right position! My character does not block while running! That is a problem with XPMS. If you're not using FNIS, you need to download the magic-shield arm patch from the XPMS file page and install it. If you are using FNIS, you need to check the skeleton arm fix patch before running Generate FNIS for Users. My left handed weapon is wielded backwards! I honestly don't know why that is happening to some people, but it is not a problem with my mod. Make sure that if you're using XPMS you install the magic-shield arm patch if you're not using FNIS. If you are using FNIS, check the skeleton arm fix patch before running Generate FNIS for Users. I installed an optional equip/unequip animation, but it only plays for the right arm while moving, and it plays the vanilla one while mounted! I'll eventually make the animations for while mounted. The left arm not playing the animation while moving is a behavior file issue, and there' s nothing I can do about it at this time. Just stand still when you draw your weapons if you want the full animation every time. The sheathing animations wholly work standing still and moving. 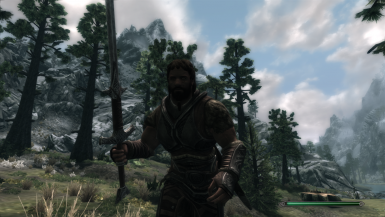 I installed an optional equip/unequip animation, but it looks silly when wielding certain weapons! The optional equip/unequip animations are mainly aimed at players who like to stick with the same weapon loadout through a playthrough. This is because the main hand weapon determines which equip/unequip animation plays. E.g. if you have a sword in your main hand, the same equip/unequip animation will play regardless of what's in your left hand. So, for example, if you know you're always going to be using a sword and shield for your one-handed setup, then you should be fine with the sword and board optional file. Keep in mind that the equip animation for the left hand does not play while moving. This is due to equip behavior files and is beyond my ability to modify at this time. Just stand still when you draw your weapons for now if you want the left handed animations. The unequip works fully every time. Also note that the animations will work for NPCs as well, so it may look silly if they are wielding certain weapon loadouts. It is not perfect; hence, it is optional. 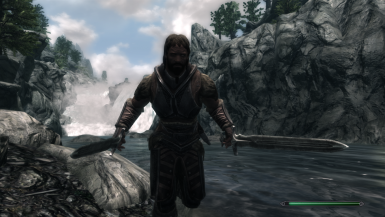 Do you have plans for two-handed animations, bows, and/or magic? Long answer: I'm not sure exactly which animations I'll be doing. I will be examining the animations to see which ones are good and which ones need to go. Is this mod compatible with the <insert mod here> skeleton? The animations are compatible with pretty much any skeleton. However, the optional equip animations may look silly if you're using certain skeletons. E.g. if your skeleton puts one-handed weapons on the hip, and you're using Dual Sword Wield on Back, it would obviously look pretty silly. Can you make a skeleton for <insert mod here>? I will consider making more skeletons in the future, but only for the popular mods. Please do not ask. I will get to it when I can. Alternatively, if anyone wants to make compatibility skeletons themselves, feel free to PM me and I'll happily upload them to the miscellaneous files. Be aware that all four skeletons need to be done though: skeleton, skeletonbeast, skeleton_female, and skeletonbeast_female. Please offer any suggestions and feedback, and let me know what you think. Click here for Immersive Animations on Tesall (tesall.ru).